Mr. Sage, Steward of the Bristol Fourth Circuit, was converted forty years ago in the old chapel on Air Balloon Hill, which is now a ruin, and has long since been superseded by the somewhat imposing structure known as “Clowes”. Two years after his conversion he became a local preacher, and his name now stands on the plan next to that of the minister. He has served for lengthy periods as Trust Secretary and School Superintendent, and took an active part in the erection of the present church. In 1882 he succeeded the late Mr. Jacob Sparks as Circuit Steward, and during the twenty-six years that he has held the office, shrewdness, tact, quiet humour, and unswerving loyalty and devotion to the church of his choice have won the love and confidence of all his brethren. Though compelled to confess to a few grey hairs he is still youthful in spirit and fairly vigorous in body. I have been unable to identify James from census returns. Can anyone point me in the right direction? 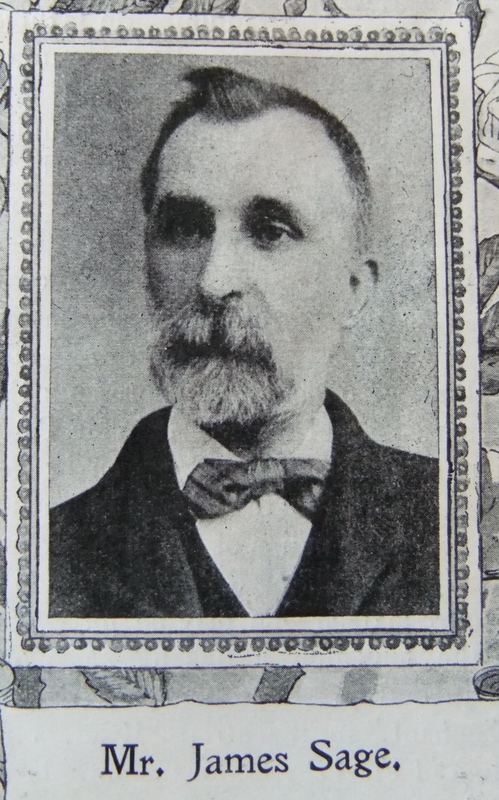 The Primitive Methodist Leader, dated 9 March 1916 reports that James retired as Circuit Steward after thirty-four years service. The Primitive Methodist Leader, dated 26 December 1918 records that James lost a son in battle.